Surrender at 20: Shadow Isles Page Updated - New Yorick, Elise, & Maokai Lore, The Princeling's Lamment, & Evelynn Story. Shadow Isles Page Updated - New Yorick, Elise, & Maokai Lore, The Princeling's Lamment, & Evelynn Story. "The mist comes for you." - The Shadow Isles page has been updated with new lore for Yorick, Elise, and Maokai, a new story for Evelynn, and The Princeling's Lament poem! The Shadow Isles lore page has been updated with several stories and new content! "The land now known as the Shadow Isles was once a beautiful realm, but it was shattered by a magical cataclysm. Black Mist permanently shrouds the isles and the land itself is tainted, corrupted by malevolent sorcery. Living beings that stand upon the Shadow Isles slowly have their life-force leeched from them, which, in turn, draws the insatiable, predatory spirits of the dead. Those who perish within the Black Mist are condemned to haunt this melancholy land for eternity. 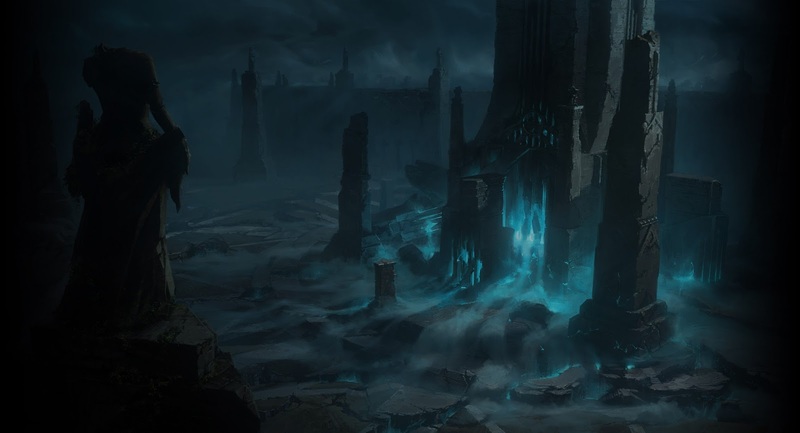 Worse, the power of the Shadow Isles is waxing stronger with every passing year, allowing the shades of undeath to extend their range and reap souls all across Runeterra." And harken to this tale of loss. A king’s pride and joy, a beauty divine. Now food for worms, her flesh to dine. Skin once fair, now left to spoil. To press his cause, to wed the heir. was blighted by a deed most foul. A poisoned cup, the king did howl. To find a cure, the Princeling swore. With knights all pledged to end death’s sleep. The very storm its name seem’d sighing. A place men named the Shadow Isles. To a night-veiled isle on no man’s chart. Only spirits summoned by death’s priest. Onward knights to this island’s heart! A clash of steel, a cry of wrath. The Princeling’s men were slain. His love of life too bright, too sweet. Pursued by spiteful wraith and wight. And a ghastly monk assailed by the mist. “Aid me!” cried he, “With sword and fist! But pride hath made this land corpse-riven. The dead we’ll fight, our lives as the prize. ‘Gainst spirits in black, with hunger infernal. Dawn never came, but the battle was done. The monk and the Princeling had won! An ancient queen, now dead and mulch-rotten. Spirits of death and carrion crow. Grim prelude to the Deathsinger’s dirge. Black mist rose up and doomed all to death. Cursed to undeath by this grief-maddened king. He begged it all end with his very last breath. Split with lightning and beaten by thunder. Phantoms now mutter in graves enshrined. A boundless curse upon all mankind. To hear this tale from the grim outcast. Unmask all, from slave to master. The Princeling’s lies laid bare by the moon. The Princeling poisoned to take her life. His soul was dark, his mind depraved. And yet his bride had one last curse. A fatal spell of bitter verse. And bring about his bloody death. A huntress aglow in mist-wreathed flame. Never to wake from his victim’s bequest. No crown for his brow, never to reign. The Princeling’s greed was his doom. Borne up through the earth, his soul took flight. The Warden of Chains drawn by his scent. Dancing to the Deathsinger’s lament. “Your soul is mine,” said the beast called Thresh. Shun the Isles where the dead still dwell. And pass the years in time well spent. A life full-lived, a soul content. And know you all are doomed to perish..."
Elise's champion bio has been updated and she has a new story! A shadow fell across him and he saw the mute steersman with his arms outstretched. Markus screamed as the steersman’s hooded robe collapsed, revealing that this was not a man at all, but a writhing nest of innumerable spiders given the semblance of a man. They fell upon him in their thousands, and his screams were choked to muffled grunts as they crawled into his mouth, clogged his ears and burrowed behind his eyes. 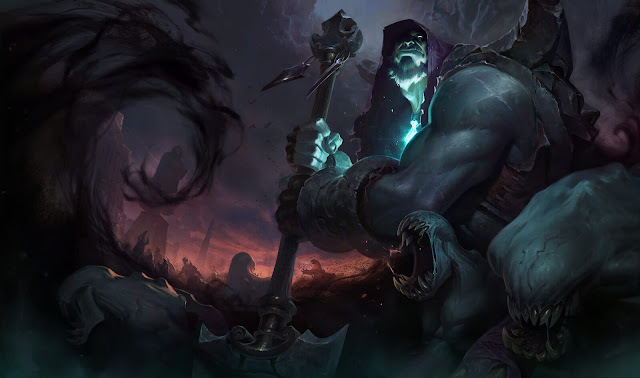 “So that I can live.”"
Maokai's champion bio has been updated and he also has a new story! Maokai is a rageful, towering treant who fights the unnatural horrors of the Shadow Isles. He was twisted into a force of vengeance after a magical cataclysm destroyed his home, surviving undeath only through the waters of life infused within his heartwood. Once a peaceful nature spirit, Maokai now furiously battles to banish the scourge of unlife from the Shadow Isles and restore his home to its former beauty. Long before living memory, a chain of islands erupted from deep beneath the ocean tides as blank slates of rock and clay. With its creation, the nature spirit Maokai was born. He took the form of a treant, with his tall body covered in bark and long limbs resembling branches. Maokai felt the profound loneliness of the land and its potential for teeming growth. He wandered from island to island in search of signs of life, growing ever more forlorn in his solitude. On a hilly isle covered in soft, rich soil, Maokai sensed a boundless energy radiating from deep beneath the ground. He plunged his great roots downward until they reached a spring of magical, life-giving water and drank deeply. From this potent liquid, he grew hundreds of saplings and planted them across the islands. Soon the land was shawled with verdant forests, groves of towering virenpine, and tangled woods, all steeped in wondrous magic. Magnificent skytrees with expansive canopies and thickly winding roots covered the isles with lush green foliage. Nature spirits were drawn to the lavish vegetation, and animals reveled in the fertile greenery. When humans eventually came to the islands, they too thrived in the land’s abundance and formed an enlightened society of scholars devoted to studying the world’s mysteries. Though Maokai was wary of their presence, he saw how they respected the sanctity of the land. Sensing the deep magic within the woods, the humans built their homes in areas not heavily forested, to avoid disturbing any nature spirits. 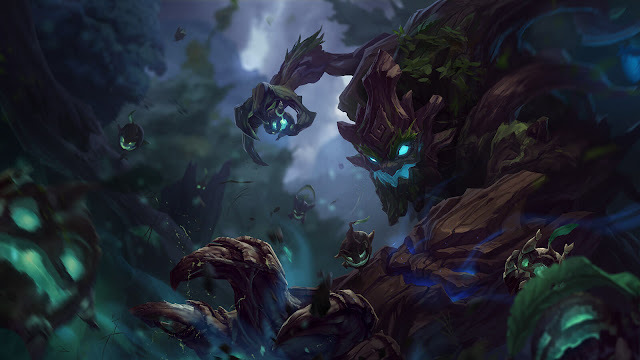 Maokai occasionally revealed himself directly to those he trusted and blessed them with knowledge of the verdant isles, even its greatest gift – the underground spring that could heal mortal wounds. Centuries passed, and Maokai lived in idyllic contentment until a fleet of soldiers from across the sea beached upon the shores of the isles. Maokai sensed something was terribly wrong. Their grief-maddened king bore the corpse of his queen and in hopes of reviving her, bathed her decayed flesh in the healing waters. Reanimated as a rotting corpse, the queen begged to return to death. The king sought to reverse what he had done, unwittingly casting a terrible curse upon the land. From leagues away, Maokai felt the first ripples of the disaster that would soon devastate the isles. He sensed a horrific force gathering beneath the soil, and a bitter chill washed over him. As the ruination spread, Maokai desperately plunged his roots deep into the ground and drank of the healing waters, saturating every fiber of his being with their magic. Before the cursed water reached him, Maokai withdrew his roots, severing all connection to the pool. He howled in rage as the sacred reservoir he had entrusted to men was fully corrupted – the spiraling coils churning underwater until nothing pure remained. Moments later, the mists surrounding the islands blackened and spread over the land, trapping all living things in an unnatural state between life and death. Maokai watched in helpless agony as all he knew – plants, nature spirits, animals, and humans alike – twisted into wretched shades. His fury grew; the great beauty he had cultivated from tiny saplings fell to ruin in an instant at the careless hand of man. The enervating mist coiled around Maokai, and he wept as the bright flowers adorning his shoulders crumbled and fell to dust. His body shuddered and contorted into a mass of gnarled roots and tangled branches as the mist leached life from him. But Maokai’s heartwood was saturated with the precious waters of life, saving him from the terrible fate of undeath. As grotesque wraiths and horrific abominations flooded the land, Maokai was overcome by a host of lifeless men. He struck the spirits with his branchlike limbs in manic violence, realizing the force of his blows could shatter them to dust. Maokai shuddered with revulsion: he had never killed before. He flew at the breathless shapes in a frenzy, but hundreds more overwhelmed him, and eventually he was forced to retreat. With his home all but decimated and his companions turned to deathless horrors, Maokai was tempted to try and escape the nightmare of the isles. But from deep within his twisted form, he felt the sacred waters giving him life. He had survived the Ruination by carrying the very heart of the islands within him, and he would not abandon his home now. As the Blessed Isles’ first nature spirit, he would remain and fight for the soul of the land. Though surrounded by endless hosts of malicious foes and darkening mist, Maokai fights with furious vengeance to conquer the evil that plagues the isles. His only pleasure comes from dealing savage violence to the soulless wraiths who roam his land. Some days, Maokai subdues the mist and its deathless spirits, breaking their hold on a grove of trees or a small thicket. Though new life has not bloomed in such cursed soil for an age, Maokai strives to carve havens, however temporary, free from regret and decay. So long as Maokai continues to fight, hope remains, for steeped within his heartwood are the uncorrupted waters of life, the last remaining chance of restoring the isles. If the land returns to its joyous state, Maokai, too, will shed his twisted form. The nature spirit brought life to these isles long ago, and he refuses to rest until the isles bloom once more. The chill wind whips through cracks in my bark with a hollow whistling sound. I shiver. My limbs have long forgotten the warmth of summer. The towering shapes around me fracture and fall in the gale. The lives within died long ago; now they are my silent companions. Their brittle trunks remain only as empty husks, rough gray sketches of the lush forest that once bloomed here. A spirit weaves between the trees in front of me, pale and spectral against the night air. A knot tightens in my bark. Normally I would lash my roots through its heart, but today I hold still, trying not to alert the wraith to my presence. I am tired of resisting. That I exist at all is an act of defiance against the curse plaguing these lands. Its moonlike eyes are vacant. There is nothing alive and vulnerable to fuel its cold bitterness on this isle of death, nothing to be hunted or consumed. The spirit slips between the trees, leaving me to my solitude. I look across the forest of shadows and my branches waver. My gaze catches – a tiny flame of red growing amid the endless gray. Nestled in a mound of black dirt, the smallest flower bud pushes up from the ground, its petals so bright they burn my eyes. It is a nightbloom. Long ago, they carpeted the floor of the Blessed Isles, blossoming on the evening of the summer solstice. By morning the flowers wilted, leaving only blackened petals, not to be seen again until the following year. But for one night, they illuminated the forest with blazing crimson, as if the very ground were aflame. I look around and, for a fleeting moment, hope that if one flower exists there might be others. But there is only the somber gray of these dead isles. My boughs creak as I take a shaky step forward. I approach the bloom, transfixed, crushing ashen leaves to dust underfoot. My colossal frame towers over its delicate shape. I lean down until my face is inches above the sweet-scented petals. The potent groundwater within my heartwood stirs, awakening in recognition. Life. The flower’s neck is tilted as if curious. Deep vermillion veins spread across each petal, and its pale green stem is coated with hundreds of silvery, velvet-soft hairs. I could spend eternity basking in its every facet. Every moment it grows and shifts in subtle ways; its stem pushing ever higher while its petals slowly unfurl. I am enchanted by each movement, however minute. I watch as the bloom spreads to reveal the filaments extending from within, its heady scent flooding my mind with color. For a moment I forget the cold, the hollow wind, and my own bitterness. A pale light flickers and I flinch. A glowing shape approaches. My bark tingles. Nothing from these bloodless woods is an ally. The cursed spirit is returning, attracted to the lure of movement. Life is not so still as death. I flex my limbs in fury, no longer eluding violence. I welcome it. For one night, a living thing will exist on these barren isles unmarred by corrupt forces. The spirit glides toward us. She was once human, but is now translucent and bone-white. Her blank expression grows ravenous as she sees the blood-red blossom. The specter races toward the flower and tries to inhale its fragile life. Before the bloom withers into a lifeless shade, I fling my limbs forward and lash them about the spirit’s legs. She screeches, recoiling as if burned, and I roar. The groundwater within me is anathema to such unnatural beings. She twists and breaks free of my grasp. I hoist my roots and smash them to the ground. The impact splits the barren topsoil and sends shockwaves through the earth. The reverberations strike the wraith and she reels in agony. I laugh bitterly. As she stirs, I sling my limbs through her form and she dissolves. Dusky mist rises from the ground, accompanied by a foul stench. As the wind moans, dozens of spirits materialize before me, their garish faces gaping silently at the scene before them. The nightbloom and I grow before the wall of shadows. I will not let them destroy this one pure thing amongst so much darkness. I throw all my rage into my blows, driving them back with furious strength. I cannot destroy every spirit on the isles, but I can hold them off for a time. A wraith tries to dart past me. I howl as I lift my roots to pierce its heart, and it dissipates into mist. My strength is draining with so many spirits nearby, but I refuse to concede. The flower grows brightly beneath the moonlight, oblivious to this battle for its very existence. A single crimson petal falls from its perfect blossom like a drop of blood. The lifecycle of the bloom is near its end, bringing death, and with it, respite. But I do not crave it. I feel I could cleanse the entire island of its scourge in my fury. The cursed mist has risen above the treeline and swirls in great clouds. An endless host of spirits pours from the fog, mouths agape with ghoulish hunger. I rise to my greatest height and slam my limbs into the ravenous spirits, shattering one after another into dust. I howl as I stir the air into a crudely twisting spiral, and nourish the storm with my wrath until it expands in a tempestuous whirlwind. I revel in the chaos as the maelstrom surges in a frenzied circle around me and the flower. It blasts the spirits violently back beyond the trees. From within this nightmare, I have carved a sanctuary where life can grow. I turn to the flower. We are silent together at the eye of the storm, still amidst the madness. A second fiery petal falls from the nightbloom, then another. My energy drains into the maelstrom, but I do not falter and the tempest rages on. With each passing moment, the blossom droops further until it faces the ground. It is perfect in its slow, natural decay. I cannot look away as it gradually loses its crown of flaming petals and wilts completely. I lower my branches and the maelstrom quiets. Above me, the sky is slate gray - as bright as it ever gets in this grim place. The gloom of the mist encroaches once more and the spirits return. Their faces are blank, no longer sensing the illicit life of the nightbloom, no longer anticipating the joy of a fresh kill. They retreat into the hollow woods. I whip my roots through a specter as it passes me, scattering its essence into the fading mist. The others edge farther away from me as they return to their gloom. Though the land appears unchanged, these isles are not the same gray wasteland they were yesterday. The waters of life stir within me and the soil beneath my roots is fertile again. Though its petals decay into dust, the luminous nightbloom burns fire-bright in my mind, igniting my fury. Just as these islands were born of burning rock, I will cleanse them of their pestilence in a flaming blaze. I follow the trailing spirits as they slip between hollow trees. They will pay for their wickedness." Evelynn also has a new story included on the page, as well as a note from Reav3 on her as a character. Swift and lethal, Evelynn is one of the most deadly - and expensive - assassins in all of Runeterra. Able to merge with shadows at will, she patiently stalks her prey, waiting for the right moment to strike. While Evelynn is clearly not entirely human, and her heritage remains unclear, it is believed that she hails from the Shadow Isles – though her link with that tortured realm remains shrouded in mystery. Saito Takeda leaned his elbows upon the lacquered surface of his desk, the thick leather of his gloves creaking as he steepled his fingers. What had once been heavy slabs of muscle in years gone by had slowly given way to fat, but he was still a big, intimidating man. His gaze was inscrutable, his eyes having long been replaced with soulless, reflective black lenses. A pair of heavily augmented bodyguards stood to either side of him. They were the best money could buy, their bodies having been turned into brutal chem-tech weapons by the brilliant, albeit deranged, scientist Singed. Takeda’s inherent violence and ambition had seen him rise from humble beginnings to become one of Zaun’s most powerful chem-barons, the infamous rulers of the undercity. Today he planned the downfall of yet another of his rivals. “Bring her in, Ortos,” he said, through a cloud of exhaled smoke. Unseen chains rattled and pulled taut, and the dark iron doors to his office ground open. Two more bodyguards stood to mute attention outside. One could never be too careful. Takeda had learned that the hard way, as his many scars attested. Takeda’s shaven-headed chamberlain, Ortos, stepped forward, leading a petite figure to the entrance. Shadows clung to her, making it difficult to see her clearly, though Takeda glimpsed a flash of blue-tinged flesh and a pair of predator’s eyes that reflected the chem-fire sconces of his office. He felt an unfamiliar tremor of apprehension at her appearance, but forced it aside. He was one of the most feared men in Zaun. Why should he feel uneasy in his own office? 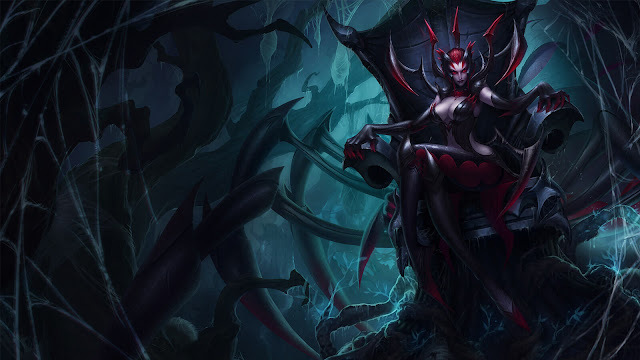 “The Lady Evelynn,” Ortos announced. Takeda waved a gloved hand, and Ortos retreated, the doors grinding shut behind him. Evelynn sauntered forward, moving with sublime grace, the heels of her boots echoing sharply. She came to a halt on the other side of Takeda’s wide desk, and planted her hands on her hips. He could see her more clearly as the shadows retreated to the corners of the room. Her slender figure was clad in gleaming red leather, and her eyes were yellow and almond-shaped, like those of a cat. A wild mane of crimson hair framed her face, and sharp canines glinted as her lips parted in a sardonic smile. “Then I’m afraid this might leave you disappointed,” hissed Evelynn. The blue-skinned assassin took a step back and instantly disappeared into shadow. Takeda’s bodyguards tensed, flexing their piston-strengthened limbs in unease. Takeda glanced left and right, trying to discern her location. Nothing. She was simply gone, vanished completely, as if she had been swallowed by the darkness. “Not bad,” he said. He’d heard of her power, of course, but such things are often over-exaggerated. He was pleased to see that in this case, the rumors were true. Taloned hands grabbed him from behind, blood red nails digging into his flesh as Evelynn emerged from the shadows. She was far stronger than she looked, and forcibly turned his head to expose his thick neck. Her grasp was ice-cold, as if warm blood no longer flowed in her veins, and her fangs were inches from his jugular. His guards turned instantly, stepping forward to defend their master, but Takeda raised a hand, stopping them in their tracks. He knew they would have been too slow had she truly wished to end his life. Takeda swallowed uncomfortably. “I don’t think that will be an issue,” he said. Evelynn released him with a shove, and sat on the edge of his table. She stretched like a cat, completely at ease. “You haven’t yet asked my price,” she said. “Money holds no interest to me, Saito,” she said. “You’ve seen only a fraction of what I can do,” said Evelynn. She leaned back, smiling. Takeda said nothing. His body was tense. He opened his mouth to speak but Evelynn interrupted him, holding up a finger. Takeda stared at her, frozen in indecision. “Very wise,” Evelynn said, after giving it a moment. She stood, moved back around the desk, and strode toward the door. She nodded toward the door, raising an eyebrow. Takeda growled an order, and the doors swung open. Before she left, Evelynn gave him a wink. Takeda sat alone in silence. After a few minutes, his chamberlain peered into the room. “Can I get you anything, my lord?” Ortos said. “No,” said Saito Takeda through gritted teeth. He slammed a fist onto his desk. “Leave me. All of you, leave me. And stoke the furnace. There are too many shadows in here...”"
"Evelynn is one of our oldest champions and, like Yorick, she’s due for a lore update. We think there’s an opportunity to give the Widowmaker more meaningful motivation and a better backstory, so that the malice in her stealthy assassinations doesn’t just feel like it was strapped on as an afterthought. Evelynn is one of those champs with a “dark, secret past,” but most of us associate her with the Shadow Isles. With all the new Shadow Isles lore recently released, we figured it would be disappointing to leave her out. That’s why we wrote a short piece especially for Eve players—those of you that embody agony’s embrace and strike terror in our hearts with ganks we never see coming. This “color text” is intended to capture Eve as you know her today: the fiend you love and the rest of us fear. That being said, we think we can do even better by Evelynn and her lore, so keep in mind when reading that she’ll likely be evolving from Runeterra’s most demonic killer-for-hire. For now, she’ll be doing what she does best: slipping into the shadows, waiting for the right time to reveal herself and a fully-fleshed story of her origins." As mentioned above, this is an update to the Shadow Isles page and the previously released stories are all still available! Check out 2015's lengthy SHADOW AND FORTUNE story, available in web, PDF, and ePUB forms. Also includes are the previously released Shadow Isles videos The Pledge from Kalista's release and Tales of the Black Mist: The Harrowing. In addition to the new stories above, champion lores for our other Shadow Isles champions, Hecarim, Karthus, Kalista, Mordekaiser, and Thresh are included on the page.